The Sacred Page: Linked with the Saint Paul Center!!! Starting today the Saint Paul Center is linking to this blog from its main page. I am so grateful for this honor. As I've said many times on this site, nothing excites me as much as the work of the Saint Paul Center. The Center produces materials for people studying the bible at all levels -- beginner, intermediate and advanced. One of my favorite projects is the new academic journal, Letter and Spirit. The inaugural issue contains articles from Robert Wilkens, Scott Hahn, and many others. The article by Brant Pitre alone is worth the price of the journal - "The 'Ransom for Many,' the New Exodus, and the End of the Exile: Redemption as the Restoration of All Israel (Mark 10:35-45)." The Center is also producing mutli-media parish bible study programs. Each bible study comes with visual aids, a presenter's guide and student notes. A fully animated and beatifully illustrated Power Point program is the default visual aid - though other options are available. I should also mention the on-line courses which are totally free and available at the website. Courses are available for students at the beginner, intermediate, and advanced levels. You can begin them at any time (there is no quarter/semester system). 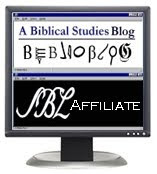 I encourage you to explore the site, which is a veritable wealth of resources: www.salvationhistory.com. I've only just begun to describe what the Center is up to these days. I'm sorry I didn't see your comment earlier. I don't look for them since there normally aren't any. But you have opened up a huge resource for me. Thank you.